Rachel - Nitrogen is a fundamental building block for plants. It's the centre of proteins which means that in order for a plant to grow, it needs nitrogen. It also needs carbon. Carbon is a bit more freely available in the soil. Nitrogen is a very growth limiting factor for plants. 79% of the atmosphere is made up of nitrogen, N2, which is a triple bond, it's very firmly bound to each other, but your average plant can't access this source of nitrogen. Legumes on the other hand are able to form a relationship with symbiotic bacteria called Rhizobia and the Rhizobia are able to take this nitrogen out of the air and make it into a plant available form which the legumes can then take up. Meera - So when you say legumes, this is plants like peas and so on, and beans. Rachel - There's peas, beans, sweat peas in your garden are also legumes. Then there's things like clovers, vetches, birdsfood trefoil, lots of different legumes that you'll find in any kind of grassland habitat. Meera - What is this relationship? So how are these bacteria useful to the plant and how do they provide it with nitrogen? Rachel - The Rhizobia fix the nitrogen as ammonia and through a series of conversions in the soil, it's made into plant available nitrates. Meera - The use of say, legumes in say, a crop environment or a farming environment should hopefully reduce the need for nitrogen fertilisers. Rachel - Yeah, that's right. In a year, a farmer will use about 200 kilograms of nitrogen per hectare per year, and if you've grown legumes in that soil you can save 10s of kilograms. So it's not going to replace it completely, but it is able to provide a good amount of nitrogen. Meera - So you've actually got some legumes here. So what plant is this? Rachel - We've got a pea plant here and we've got its roots out on display so that you can see all the little root nodules on the roots. We've got quite big root nodules and they're nice and pink, which means they're fixing nitrogen at the moment. Meera - Looking at these, there are kind of like strings coming out of the soil, but on there, there are these very clear round lumps. Rachel - In each of those nodules, there'll be millions and millions of Rhizobia bacteria, but it's not all bacteria, there's plant cells in there as well. Once they're inside the plant, once they're inside the root nodule, they differentiate into these bacteroid cells, and they're the ones who actually fix the nitrogen. But once they've turned into bacteroides, there's no going back. They can't turn back into free-living bacteria. Meera - Just next to this here, you've got an agar plate which has got Rhizobia on it too, but this essentially looks like just a pink slime. Rachel - Yeah, that's right. It's very slimy. It's only pink because I've got dye in the agar which helps me to differentiate between Rhizobia and other strains of bacteria. The sliminess, which is another thing that helps me tell if it's Rhizobia, is because of these polysaccharides that the Rhizobia produce, I just then really call it goo. The goo helps them to move through the soil, to stick to the plant roots, and when it's left behind, it helps to increase soil structure, it helps to stick soil aggregates together. Meera - So, when a legume or a plant that kind of works with these bacteria is planted, these bacteria actively kind of search and go to the root. So, although they're giving nitrates to the plant, these bacteria actually need the plant. Rachel - They do. They can survive in the soil on their own, but sometimes food can be a bit hard to come by and soil, it's very complex. There's millions and millions of bacteria, and they're all competing with each other, so if a Rhizobia can find a legume that it's compatible with it, it's got a sneaky out from that hard lifestyle, it can go and get a nice cushy lifestyle if it can find a legume root, form a relationship with it, and get a steady supply of carbon. Meera - This is a pea plant you've got here, but your work focuses in on a very particular type of nitrogen fixing plant. Rachel - Yes, that's right. I work with Lucerne, which is a more agricultural plant, you probably wouldn't grow it in your garden, but if you're a farmer and you want to grow a legume, it's brilliant because it's very, very drought tolerant. It can have roots that can be metres deep. It can access water and nutrients from way down in the soil profile. It also provides a very high quality feed fodder. It's very good for cattle and for horses. Meera - So farmers are already kind of using it and know about it? Rachel - It's been grown in this country on and off for about the last 300 years, farmers have been aware of it for a long time. It comes in and out of fashion because it's so drought tolerant. So when the weather dries up a bit, it gets used more. 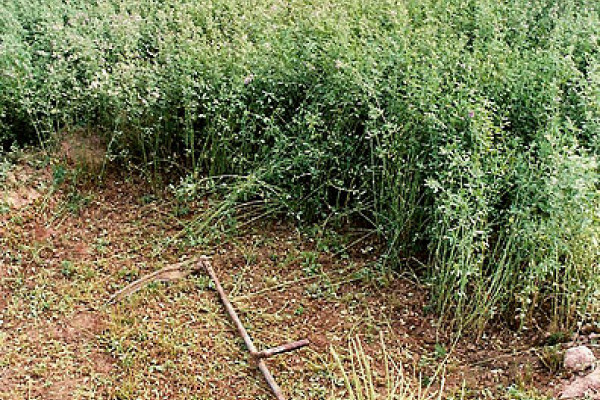 But the only problem is that this Lucerne plant originated in the Middle-East and that means that the Rhizobia that it likes aren't necessarily in England. So, we need to make sure that when it's planted, it has the right Rhizobia, so it can fix nitrogen. Meera - Your project now is to identify different strains of this Rhizobium that are helping it to grow outside of its native region? Rachel - Yeah, that's correct. I'm hoping to find different strains that will be subtly different and those subtle differences will be what enable it to survive in a different habitat. Meera - And how do you find this out? So how do you decipher what bacteria are going to work where? Rachel - So what I've been doing is I've been collecting soil from various farm sites and then I grow up these legumes, add some of the soil to catch the Rhizobia out of the soil, into a root nodule on a plant, and then I take that root nodule, squish it, placed it up so it goes all goopy on agar, and then I try and find out what it is using genetic techniques. Meera - So what stage are you at with this now? Do you have some strains that you've identified? Rachel - At the moment, I have a freezer-full of Rhizobia strains that I've isolated from plants that I've grown. So, I know that they're strains that work with Lucerne. The next stage will be to find out how they're differing. Meera - And what's the kind of long term aim with this really? Is it to improve say, crop yields in the future? Rachel - My hope would be that say, you've got a farmer who thinks, "My land is getting dry at times", I'd quite like to grow a legume that is going to be stable under drought conditions, but I don't live in an area that has really grown Lucerne before I want to be able to matchmake the Rhizobia that they need with this soil that they have, and find a useful strain that will help Lucerne grow there. Meera - So, it's really just matching the bacteria to the plant and to the setting, all in one go and will it just be as simple as knowing the soil type and therefore adding the right bacteria, the right Rhizobia, to it? Rachel - If a farmer knows what their soil type is like, it will hopefully just be a case of matching that soil type to the right strain, adding it as an inoculum to the seeds as you drill the seed into the soil. Then as the plant grows, we'll be able to form a relationship with that Rhizobia and get on and fix some nitrogen. Meera - And I guess just lastly really, why do we want to grow this so much? Is it say, so much more useful than any other potential legumes? Rachel - Well, the real benefit to it is that it is so drought tolerant. With climate instability, it would provide a bit more reliability of fixing nitrogen. So you've grown your standard clover mix that might not cope with the heat and the drought whereas Lucerne would. Is Earth's total water finite? Please note that the details were in the image alt text too.